I am new and apologise if I've posted in the wrong forum. I primarily use MS Office 2007 Outlook and Word and lately both keep flickering/refreshing every 10 seconds. How do I stop it? I tried doing a Google and could not find anything solving this problem. Please help and thanks. 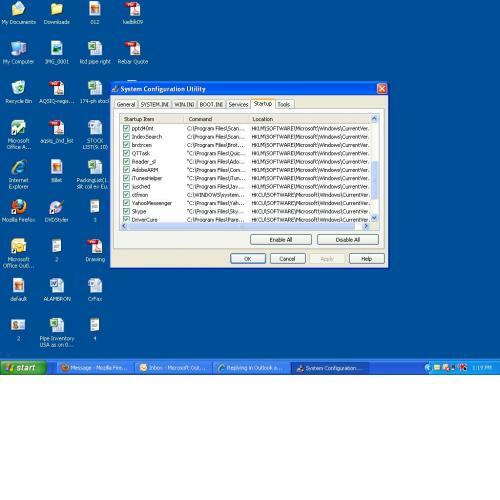 Are you using a Windows XP machine or a Vista machine? If its XP try this and let us know if it work out for you. Download Tweak UI from Microsoft. Be sure to download the program to a location where you can easily find it, like your Desktop. Double-click the downloaded file to install it.Then Click on Start, then All Programs (or Programs), then to the Powertoys for Windows XP folder. In the Tweak UI program, click the + next to General on the left and Click on Focus. On the right, check the Prevent applications from stealing focus checkbox and then click the OK button. Close all windows and see it worked out for you. Thanks but it did not work. I also noticed that when I have MS Office opened and by that I mean Outlook, the whole laptop seems to be refreshing. Do I have a virus? I ran Kaspersky and BitDefender online, but could not find anything. Any suggestions? This is driving me crazy as I cannot do anything due to the laptop/office refreshing/flickering every 10 secs. Does the screen flicker or is it just that the program does not stay selected? In your next reply attach the screenshot. The screenshots attached. I have this problem only when I start MS Office. Office and Win Explorer starts flickering/refreshing every 10 secs. Thanks for your help. restart the machine and say no to the prompt from msconfig to revert the changes and check outlook now. I believe you are on the right track with your suggestion. Something to think about with the display driver theory is why it only does this with Outlook and word. If it was a driver it should do it with just about everything. I suspect that you are reading from the link that I had pasted and telling me to do what that poster had done, which eitherways I would have done if it was possible, because if you had taken the trouble of going through the screenshots of the startup that I have pasted, you'd have noticed that I don't have igfxtray.exe and igfxpers.exe in my start-up. hkcmd.exe has always been there in startup from day one, so I don't know how useful unchecking it would have been. This is the 3rd suggestion of yours wich has not worked and I am left with the feeling that you are experimenting at my expense. capescor please understand that not every issue is the same and we do not know what you have or have not tried. What vinod advises is at best suggestions and sometimes the reason for the issue is unknown and has to be determined by doing steps which can or can not resolve it. We do not experiment at a OP's expense and try to give the best advice possible. Now since there is a problem then let's go forward with some planned steps. As another step boot into Safe Mode with networking and try the program then. Does the issue happen then? If not then you have a driver problem that is loading in normal mode. If it happens in Safe Mode then the problem is either hardware or a software issue. Software by program or OS system itself.